We offer 10K, 14K, and 18K gold findings in white or yellow. Gold filled uses a karat gold overlay which is then bonded to a brass inner core. 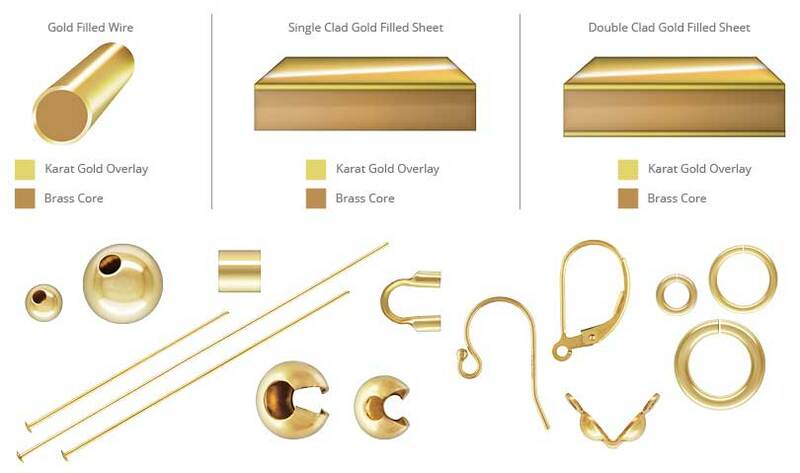 JK Findings manufactures gold filled with 1/20th 14 karat gold, meaning, it is 5% 14 karat gold by weight with a brass inner core. We offer 1/20 14K rose gold filled and 1/20 14K yellow gold filled. For more information on the difference between plating and gold filled or silver filled, visit www.jvclegal.org. All silver items contain a minimum of .925 silver (the remaining balance is made up of copper). As part of our sustainability program, JK Findings only buys Green Silver for use in our production process. All of our .925 silver items are nickel free. Silver filled uses a sterling silver overlay which is then bonded to a brass inner core. 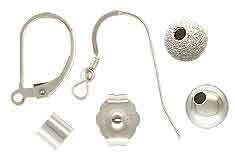 JK Findings manufactures silver filled with 1/10 .925 silver, meaning, it is 10% .925 silver by weight with a brass core. Made with copper and zinc. Most of our brass is 90% copper, 10% zinc, but we also sell 88/12 and 92/8 brass. Made with 90% copper, 10% tin. All steel items are made from Stainless Steel. To use this grid, locate intersection of desired metal and present metal. This number is your conversion factor. Multiply that number by actual known weight of present metal, e.g., to determine what an item that weighs 1.50 dwt in Sterling would weigh in 14K Yellow, go to 14K Yellow under Desired Metal column. Follow that row across until it intersects the Sterling column. This is your conversion factor (in this case 1.248). Then multiply that number 1.248 (conversion factor) by 1.5 (known weight) = 1.872 dwt. This would be the weight for the 14K Yellow item.